Prof. Angelo Davì (University of Rome “La Sapienza”) has recently published in the Recueil des cours (vol. 352) the course on renvoi held at the Hague Academy of International Law: “Le renvoi en droit international privé contemporain“. The Course deals with the modern development of scientific thinking on renvoi, examines its various functions in contemporary legal systems and assesses the importance of its current role. 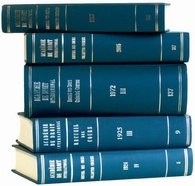 The different models of renvoi present in domestic legislations as well as in uniform rules on conflict of laws, of either a conventional or supra-national origin, are analysed on the basis of the fundamental distinction between models which merely take into account foreign choice of law rules and models based on a complete reconstruction of the content of foreign private international law. Ample space is accorded to developments in the EU system of private international law, as well as to an analysis of the relationship between renvoi and other methods and techniques currently employed in this area of the law, mainly for the purpose of assessing the effects their diffusion is likely to produce on the role played by renvoi as an instrument of coordination in contemporary private international law. Title: Le renvoi en droit international privé contemporain, by Angelo Davì, Brill Academic Publishers – Martinus Nijhoff (series: Collected Courses of the Hague Academy of International Law, vol. 352), Leiden, 2012, pp. 528. ISBN: 9789004227262. Price: EUR 145. Available at Brill. Previous post: ASIL Conference on What is Private International Law?